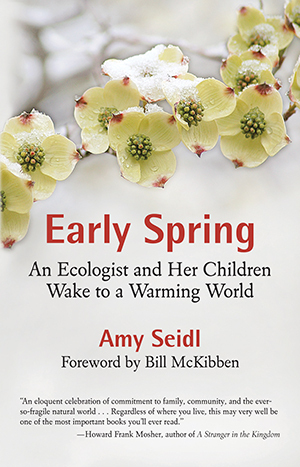 With an engaging mix of memoir and science, Amy Seidl brings the reality of global warming to a personal level. As a mother, Seidl demonstrates how climate change has altered her daughters’ experiences of their woods and garden, and the seasonal community events of her small New England town. As an ecologist, Seidl explains how natural upheaval occurs in the microcosms of our backyards and parks. While the human community, including Seidl’s daughters, adapts to a changing climate, plants and animals also adapt, she shows, in ways both obvious and surprising. As a mother who has borne life, as a person who delights in the diversity of life, and as an ecologist who realizes that life in our gardens, forests, lakes, and meadows relies on the countless multitude of species and their interactions, I am unsettled by global warming. I fear it will have a tragic effect on all forms of existence, including our own. I chose to write this book after I spent years researching natural systems. As a field scientist I have worked around the world studying Antarctic, alpine, coastal, temperate, and tropical ecosystems. These experiences sharpened my ability to understand how natural communities work, to identify species across taxa, and to admire their complexity and beauty. But it was after these experiences, when I was bound to a single place as the mother of two young daughters and the wife of a man establishing his caxi reer that I began to carefully observe my immediate environment. Here, outside my door in rural Vermont, I readily found signals that the natural world was changing. It was at this point that I decided to collect my observations about climate change in a book and call it Early Spring. I chose the title to signify one of the strongest signals of global warming for the Northern Hemisphere: spring is coming days earlier with each decade. I decided that by sharing the signals of warming from my garden and woods, the places where I take my children to swim or where we walk along the road and collect stones, I could localize the experience of global warming for my readers. Further, by describing the ecological flux that is a consequence of climate change in the iconic New England landscape, I hoped to engage with the significance of global warming to all life, including our own. Throughout Early Spring I apply my knowledge of ecology and evolutionary biology to reveal the effect of global warming in the landscapes I have studied as well as the landscape where I presently live. To these descriptions I add personal stories of how ecosystem health is being altered--at micro and macro perspectives. I also examine climate change in relation to the fact that I have small children--Helen was one when I began this project and Celia was six--and I relay my concern for their ecological future and the planet they will inherit as global warming progresses. While I have spent time in regions of the world where global warming is more rapidly affecting ecosystems, I want to emphasize the changes I see in my landscape close to home--in my garden, in local woods and ponds. It is in this everyday context that I notice the world entering flux. The timing of seasonal events, for instance, is shifting: lilacs are blooming earlier, gardens remain prolific well into the fall, and butterflies appear weeks earlier than previously recorded. But it is not only the natural landscapes that are shifting. In my rural community, cultural traditions tied to the season are no longer assured: ice-fishing derbies and winter carnivals, once relied upon as cold-season diversions, are on-again, off-again, and the start of maple sugaring rarely begins in early March as it historically did. As I wake to these signs, I place each onto a growing list that challenges my sense of season, cycle, and time, even my expectation of what is true. With each year I am compelled to ask: How are the natural communities and ecosystems where I live responding to climate change? What does a thunderstorm in January signal? What about deluges in May that preclude spring planting? And the absence of ice on rivers and ponds in early winter? These are examples from my landscape--and the natural and agricultural communities in it--that signal that the world around me is moving into flux. As these events collect, I realize how more and more of my observations reflect the predictions that climate scientists are making for New England--greater single precipitation events, warmer nights, shorter winters, and overall more variable weather. While it remains difficult to draw causal relationships between global climate change and local weather, we are able to see how our local conditions increasingly resemble the forecasted predictions. I am not alone in noticing changes in the landscape where I live. Fortunately, there are others who have observed and recorded changes or are currently noting and writing about them, many for far longer than I have. There is Kathleen Anderson, who has for thirty years kept daily records of the flora and fauna that she sees on her farm in Massachusetts and when particular species come and go. There’s my neighbor Bob Low, who notes the area’s weather and keeps an annual list of the birds on Gillett Pond, the place where I bring my daughters to skate and canoe. These record keepers are motivated by their enjoyment of the natural world and also by the feeling that they are a part of the annual cycle they document. Like the famous conservation biologist and ethicist Aldo Leopold, who kept records of bird and plant sightings on his Wisconsin farm, these environmental diarists maintain a close connection with their home environment, and their diaries provide a history of this intimacy. Now these diaries are being used to further our scientific understanding of climate change. Statisticians and ecologists are analyzing them for the occurrences they document, and the presence and absence of species is being added to electronic databases and computer models in an attempt to see repeating patterns of change across landscapes. Equally important, these narratives serve as a local chronicle of how human communities are experiencing the local effect of a global event. Indeed, the longer these diaries have been kept, the better they are at relating how our seasonal expectations are being preempted by anomalous events, how the familiar is being superseded by the unusual.